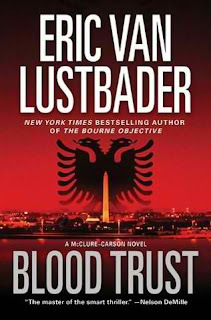 Blood Trust is the third book in the Jack McClure thriller series by Eric Van Lustbader . Former first daughter Alli Carson is being framed for torturing and murdering her boyfriend after his body is found near the Fearington Institute, where Alli is studying to become an FBI agent. Since the President of the United States -- Alli's father -- and her mother have died recently as the result of a horrible car accident, Alli has nobody else to turn to but National Security Adviser Jack McClure, who has helped save Alli from dangerous situations in the past. As Alli and Jack investigate, they are led into the heart of an Albanian slave trade and learn that not all can be trusted, especially not even Alli's own uncle, Henry Carson. In a whirlwind of action and suspense, Alli and Jack fight side by side to make things right. 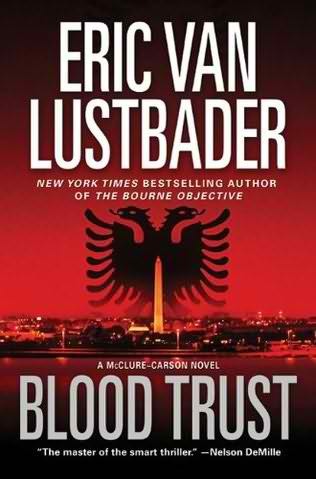 Despite how Blood Trust is advertised by the publisher, it definitely doesn't qualify as a "stand-alone" novel. To really connect with the characters and their history with each other, you would be better off reading the first two novels; First Daughter (2008) and Last Snow (2010). Just as in First Daughter , Jack continues to hear the voice of his dead daughter Emma, who jumps into his head at the most opportune times to point him in the right direction of his investigations. Oh yeah, and Emma also jumps into Alli's head as well, as the two were best friends before Emma's death. The plot is messy, over-the-top melodramatic, far-fetched, and well, for lack of a better word -- just plain cheesy. I would recommend Blood Trust only to readers who have read First Daughter and Last Snow and genuinely enjoyed them. I wouldn't recommend this novel to fans of political thrillers in general because truly, there are much better novels out there to immerse yourself in. A YouTube trailer for Last Snow can be seen here: YouTube -- First Snow trailer.